The machine is a full-automatic multiple-function washing, filling and capping unit. It is used in washing, filling and sealing all kinds of drinks carbonated drink. The machine has features of unique design, new style, complete functions, multi-purpose, convenient in operation, beautiful construction, high automatism. It is the best filling equipment in China. This machine is rotary washing system, which mainly use for beverage production line, such as mineral water or carbonated drink, new bottle enter the equipment by star wheel, through clipper and overturn mechanism to make bottle upside down, after rinsing with strong water force, it overturns bottle up automatically, then transport to the filling system by star steel, the main material and rinsing clippers is made of stainless steel material. The material is anti-corrosion stainless steel, the wheel has block bottle protect device. A. Filling valve use isobar filling valve, high speed and big flow, the high accuracy filling valve, filling speed fast, the liquid level is stable. B. Main drive adopt gear drive independent, high efficiency, small noise, long life, maintenance-free, transducer can control the main motor speed, the machine adopt Variable-frequency variable speed, whole operations area, engine base is stainless steel contain carbon steel. The bottle enters into the click wheel through the transition card with bottle neck capping system. Rotary capping machine knife stuck on the bottle neck location, keeping the bottle upright and prevent rotation. Capping machine’s capping head keeps revolution and rotation, under the action of cam to complete cap grasping, capping, cap pressing, cap release processes for a complete capping process. Controlling center of capping machine locates on the top hopper, through cap dropping rail and cover plate connected with capping machine system. Finished bottle through the bottle capping machine sent from the click wheel to the bottle conveyor chains, into the next process. Nylon wheel and conveyor belt cooperate for the output bottle. Conveyor motor adopts frequency control for motor speed, which keep pace with the 3-1 machine. Prevent overturned bottles. The machine body rack is welded by high quality carbon steel, antirust processing and painting surface, which is covered by the SUS 304 outside. The electronic components like PLC and transducer are from Mitsubishi, Omron, etc., the pneumatic devices are also from international famous brand. Japan PLC microchip control with touch-screen interface, full-automatic multiple-function washing, filling and capping unit. Its performance is as following: all parts, for instance, filling valve, which directly contact medium, are made of stainless steel or harmless material. So it conforms to the requirements of Food sanitation. Adopting equal pressure filling principle and current spring valves in order to assure beverage quality. Italy AROL capping technology, by using advanced magnetic coupler to regulate cap-screwing torque, in order to assure capping quality. The gravity fixed liquid surface filling is adopted. Spring cramps are used in the bottle washing process. The empty bottles can be turned over 180° along the conveying rail. High efficiency of rinsing, there are two times of internal and external rinsing. The magnetic torque is adopted for screw capping. The power of screw capping can be adjusted without steps. Well protection for capping, the power of the screw capping can be fixed to avoid any damage of caps. The amount of the drinks in the storage tank can be controlled automatically. Bottle detector is adopted, when there is no bottle, filing and capping will stop automatically. 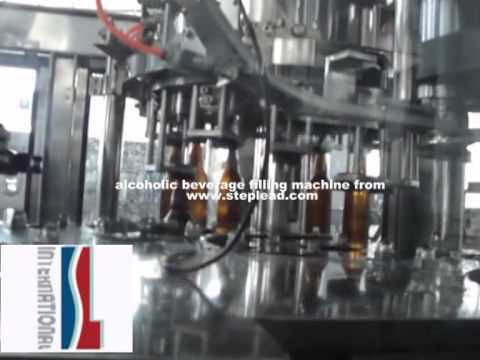 Caps detector is adopted, when bottles are cramped wrongly or when caps are not available, the machine can be stopped automatically. The production capacity can be displayed digitally and can be adjusted conveniently. Automatic photoelectricity detection and automatic break-down when malfunction occurs.